On this beautiful Saturday, I am pleased to share this beautiful Etsy treasures with you. Just in case your Saturday is not as 75-and-sunny as our day here in Charleston SC (don’t be too jealous, I’m sure something this good won’t last), these should warm up your day! 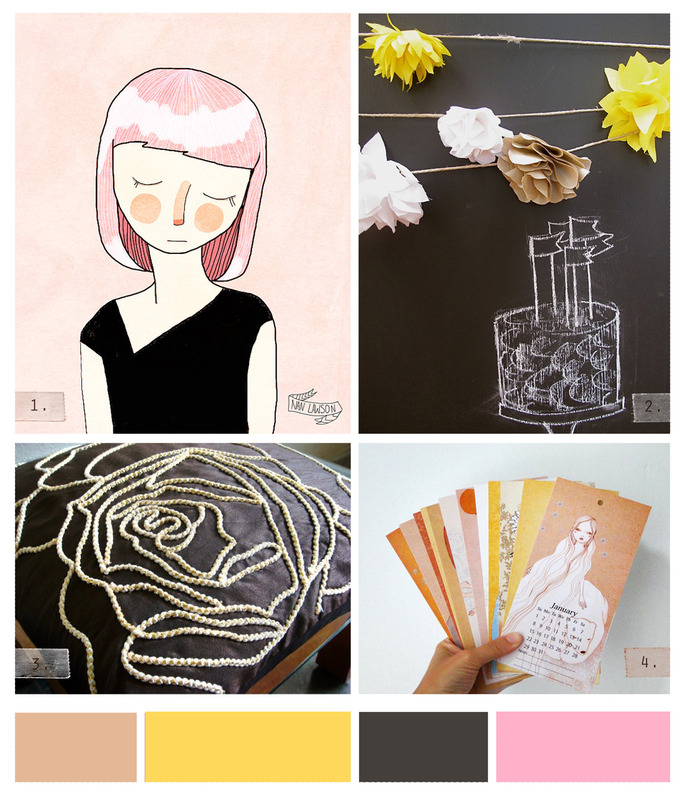 I love the color pallet this little collection created. Let spring get here soon! #1: “Charlotte” I love this illustration by Nan Lawson. It is simple and whimsical, yet emotional and it’s aching for a story to accompany it! #2: Spring Neutrals Fabric Flowers created by Katie Speed are probably the very cutest garland to ever grace a chalk board. Note-to-self, next party I throw, buy a large chalkboard, draw a super cute table-scape and top it all off with a darling fabric garland. Perfect. #3: Enchanted Rose Pillow crafted by Urvi Agrawal would look perfect on my bed. Just sayin’! I love the drawn, outlined shape of the flower, and the chunky embroidery is beautiful. #4: 2012 calendar cards, created by Irena Sophia. 12 months of beautiful illustrations; it’s like having your own personal rotating gallery! I’ve gotta tell ya, I love your site. It looks amazing and the stuff on it is just gold!